Eleven years subscribing to Time and I still don’t know what the word means. Not exactly. But I’m pretty sure what I was doing deep down inside my camel hair coat that murderously cold winter morning was hunkering. The pitiful little kiosk at the bus stop was filled with hunkerers, although they chose to hunker independently of each other. Cattle may huddle together to share their warmth in the winter cold, but in that respect your average cow shows her smarts over your average commuter. If you found yourself unconsciously gravitating toward one of the other bundled figures hoping to generate some warmth in a combined hunker, your hoped-for heatmate would – rather consciously – sidle away. The threat of frostbite held no candle (pardon the conflicted imagery) to preserving personal space. So, there we were, the usual morning crowd waiting for the 7:03 which, no doubt, would arrive later than 7:03 owing to the snow which had fallen the better part of the night and was still falling. At least I presumed we were the usual morning crowd since I could see none of the usual identifying markers. Collars were pulled up, hats pulled down, hoods cinched closed, scarves tucked in and around. The only human element showing through gaps in the swaddling were teary eyes squinting against the wind. The London Fog coat, the candy-red goulashes, the arctic cap, the pink nylon ski jacket, the Pittsburgh Steelers woolen watch cap...I knew I must’ve seen them before, but I had no faces in mind to attach to them. Having absolutely no clue as to what the current fashion standards were, I couldn’t even be sure as to whether or not candy-red goulashes and Steelers’ caps indicated – respectively – female or male. The usual nods and barely perceptible smiles which passed as hellos between people who would rather still be home asleep (warmly asleep, I should say), or were more interested in their morning reading, had also disappeared inside the anti-weather sheathing. Our fingers stinging from the cold wind, our feet damp and cold from the slush which had baptized us all as we had struggled through the narrow passage cut through the snow banks the plows had thrown up along the curb, we were less concerned with observing even the cursory niceties of commuting than with trying not to freeze to death. I fumbled my Time out of my briefcase with clumsy, numbed fingers. My Italian-made gloves, a stocking stuffer from my wife, were elegant, admirably flexible, color-complemented to my coat, and near-useless in that kind of wind chill. That morning I had reached for the caution-light-yellow moosehide mittens I’d bought on our vacation in Quebec that fall but Eileen had refused to let me out of the house so mismatched. After that exchange, it seemed the better part of discretion to avoid even broaching the topic of stocking cap vs. the “cute” little duffer’s cap she was holding out to me (this a recent birthday present). The only proper response was to wear the gloves, the cute cap, smile gratefully that she had prevented me from committing a grievous style faux pas, then step outside to my frigid doom. I tried turning my back to the wind but it was a rather cunning gale. No matter how one turned, the cold air whipped inside the half-walls of the kiosk, whirled about until it found some gap in your winterwear through which it stabbed deeply and, needless to say, coldly. I tried to focus my stinging eyes on the “Letters to the Editor” section, but the wind was so ferocious the page corner flapped like a hummingbird’s wings and began to tear. I experimented with different one-handed grips thinking if I could hold the magazine in one-handed relays, keeping the other buried deep in my coat pocket, switching hands as the exposed one grew numb, I might yet come through the morning with a few fingers left. But, since it would only take a few seconds for the in-use hand to succumb to the cold, I spent more time switching hands than reading. I kept at it, though, not out of dedication to being an informed citizen, but in the hope reading might take my mind off the slush which had seeped in over the rim of my Totes and at how late the bus was running. He had to shout to cut through the wind as well as my concentration on the “Conventional Wisdom” column. It occurred to me perhaps he’d been standing there shouting at me for some time, but I’d only just now heard him. My cold-addled responses were a bit sluggish. I looked up from “Conventional Wisdom” and blinked against the wind at the shorter, parka-clad figure in front of me. It hadn’t yet come to me a response was required. “Excuse me!” he tried again. He was wearing an enviably warm-looking parka, the kind I’d only seen in documentaries about the arctic. He was also wearing amber-tinted snow goggles, some kind of synthetic snow pants and well-broken-in Timberlines. Not color-coordinated at all, but damned warm, I guessed. From under his hood, mixed in with the fur trim, was an exploding shock of napalm-red hair. I motioned at myself with my magazine, asking if he meant me. I made a show of looking past him for my bus, inferring perhaps he should better ask someone else as I’d be leaving momentarily. “I just need a little help,” he said. There was a rather unfortunate history to the bus stop and I’m sure my fellow hunkerers – like me – were waiting to see if the parka-clad little fellow would make a sudden lunge, shoving copies of Watchtower at me, or ask for “spare change,” or if I was interested in a charcoal water filtration system or AMWAY floor wax. I looked around the kiosk and saw my commuter colleagues had subtly sidled away. I was on my own. I took a good look at him, then. He had pushed the fur-trimmed rim of his hood back from his face a bit. It was a young face, but beaten into saddle leather by weather, marked with a hesitant scrub along his jaw line, and, peeping over his shoulder like a sunrise, was a Day-Glo orange backpack, one of those huge contraptions running from shoulder to rump, capped with what I assumed was some kind of bedroll. “I need some directions,” he said. He pushed his hood back still further revealing more of that head of matted, blindingly red hair. “I’m a little lost,” he said and flashed brilliantly white teeth in a slightly embarrassed smile. “Where’d you come up from?” the pink nylon ski jacket asked. “Aren’t you cold?” This from the London Fog coat. “What’s in Toronto?” I asked. “Further north you go, it’s just going to get colder,” from the woman (I think) in the candy-red goulashes. None of us were too sure which way north was, but we confabulated a bit, came up with what we considered a reasonable estimate, and were pointing the young trekker on his way by the time the 7:03 showed up ten minutes late. The kiosk crew filed on the bus but I held back, watching that iridescent backpack bob off through the blowing snow. “Are you sure you’re going to be all right?” I called to him. He shook his head, the smile turning grateful, then he waved a thanks, turned about and marched off, leaning into the wind. The interior of the bus was steamy from the bulky shapes wedged into the narrow seats. There was still room in the back. I took a seat in the last row and wiped a little porthole in the mist covering the window. “Some kinda elf,” I heard from somewhere in the bus. I got one last glimpse of that radiant backpack, bouncing to his steady cadence, then the bus engine revved and I lost him in a cloud of blue exhaust. Copyright 2009, Bill Mesce, Jr.. © This work is protected under the U.S. copyright laws. It may not be reproduced, reprinted, reused, or altered without the expressed written permission of the author. 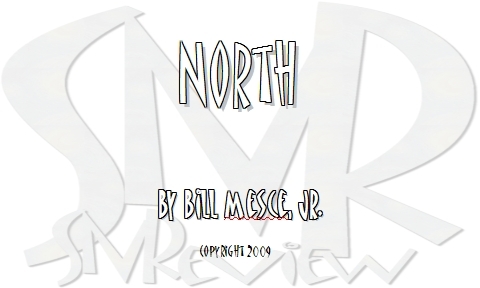 Bill Mesce, Jr. is a produced screenwriter and playwright, and published author of fiction and non-fiction. His most recent titles are the novel Four Day Shoot and academic work, Overkill: The Rise and Fall of Thriller Cinema. His one-act play, A Good Kid, was included in the anthology, One Acts of Note 2008 from Desert Road Publishing. He lives in New Jersey.